Adrift, originally dubbed Warhouse, is a Halo 4 multiplayer map. The map is small, symmetrical stage designed for Slayer gametypes. Adrift is set on a Colonial Administration Authority Springhill-class mining ship CAA Heavy Burden (CFM-88) orbiting a gas giant near Kholo. 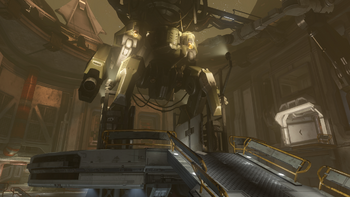 The map is centered around a large room with multiple levels and walkways, and a stationary HRUNTING/YGGDRASIL Mark II (D) exoskeleton under construction by a series of robot arms. The outer area of the map features man cannons which allow players to quickly traverse the area. An asteroid belt can also be seen looming over the map. The map is rather small in size and symmetrical. Hallways, tunnels, and routes make up the outer parts of the map, leading into a central room. There is two bases on either side of the map, where each team spawns. The man cannons allow players to return to the spawn locations. There is essentially three straight routes throughout the entire map, going from one base to the other. Two of the routes lead directly to the other base, while the middle route leads to the center room. There are numerous entrances to the center room, or the "Armory", that help prevent camping. The center room consists of three levels. In the middle of the room, a raised platform provides a height advantage over the rest of the center. It is here that the powered exoskeleton prototype is being developed. There are two access doors level with the platform, with a gap between the doors and platform. The lower level features a dual set of grav lifts that allows players to reach the second level. The large amount of cover in the center near the entrances allow players to kill exposed enemies standing in the room. An Overshield will spawn in the center of the map, enforcing a rush for top mid. The center is where most firefights will occur on the map, since most platforms lead to the room. There are several hallways and routes around the map, with tight corridors and corners. The lower-leveled hallway connects to the base and will lead to a man cannon, allowing the player to quickly reach opposing bases and objectives. The lower hallway also features a stairway, in the middle of the hallway, that will take the player to the lower level in the center room on the map. Railings located on the outside areas of the map help prevent the player from falling to their death. A sniper rifle spawns on each corner adjacent to either team's spawns. The lower region of Adrift features two grav lifts, four stairwells, and multiple crates which can be used to jump up to the next level of the map. The grav lifts lead to the nearby hallway of either player base, depending on which lift is taken by the player. The hallway by the grav lifts connects a platform that holds a single man cannon, capable of taking the player to the base or objective. The spawning bases on the map are covered in platforms and crates. The third hallway leads to the highest level in the center room of Adrift, where power ups or power weapons are commonly found. Due to the amount of raised platforms and overall verticality present in the level, a jetpack is very useful in traversing the map's middle section, as it can allow the player to circumvent easily naded stairwells to pursue a surprise attack. Promethean vision is also useful on the map. The amount of corners on the map allows players to ambush unsuspecting players with ease, especially with the use of the Boltshot, which can generally one shot within the confines of the map's hallways. The thruster pack is also recommended due to the close quarters nature of the map, which enables reliably thrusting over an opposing player's head for a potential assassination. It is best to avoid the hallways that lead to the center, due to the amount of grenades thrown in the area. However, the hallways can be baited by an attentive player with a sniper rifle due to the line of sight across the map to the other populated hallway, and to various areas in the map's midsection. The overshield that spawns can be easily baited for if a player tosses a grenade off the nearby walls of the power up. Doing this during the initial rush for the overshield can result in the would-be obtaining player's shields being dropped, allowing for an easy headshot. Additionally, spawning with a storm rifle or a plasma pistol can allow for a quick burn on a player who has already obtained the overshield. Adrift underwent a slight visual overhaul for the retail build, following the E3 2012 build. This change included a shift in lighting, brightening the outside areas of the map, while darkening the interior of the ship. In the E3 2012 build of Halo 4, the mining vessel's hull classification symbol was FFG-88, designating it as a frigate. Small explosions can be seen in the distant parts of the ship. Concept art of the mech in the centre of the map. Concept art of the central room. Note the label "LV426" on the tank; a reference to the primary setting of the film Aliens. An old shot of Adrift, featuring a different lighting setup. A shot of the Mark II (D) exoskeleton. External rear view of the mining ship in Adrift. Adrift loading screen, as seen in Halo: The Master Chief Collection.